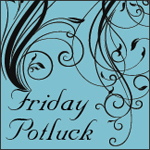 Friday Potluck is a little late today, due to, er, technical difficulties! Actually, somewhere this week, I lost a day, and forgot to post. The brain really is just a big computer, right? See? Technical difficulties. If you want to get updates on my posts, and any promotions I'm running, please follow via Google Friend Connect (in the bar to the right).